Last edited by lklassen331 on Thu Feb 02, 2017 12:00 pm, edited 1 time in total. really nice ,thanks for sharing with us! Thanks for the share, and the ideas. Thanks for the share!! Didn't open in inscape for some reason will play with it later..
Slick idea and nice plates! Thanks for sharing! Thanks!! I'll use these for sure. No problem... If anyone else has any they'd like to share, that would be awesome. I tend to run out of ideas pretty quick! Also I wonder if your problem Largemouthlou could be because that 4x4 plate has quite a few line segments that are not connected... idk why that is but I'll connect them and see if that works..
Largemouthlou wrote: Thanks for the share!! Didn't open in inscape for some reason will play with it later.. Worked for me in Inkscape. Haven't had time to look at it, when I click on dxf computer asks if I want to open or save. When I say open it don't show up. I will save then import and try that.. Thanks. Nice... Thanks. 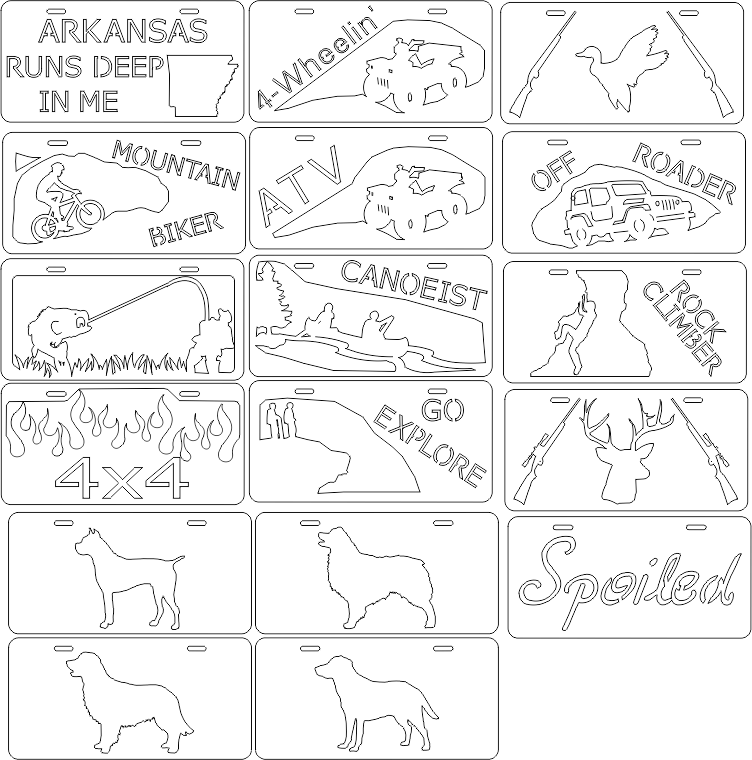 A lot of states have front and back plates, but these are nice designs. Nice work, all great ideas. Thank you for the share. I have this issue with several DFX files and Inkscape. Anyone know what we are doing wrong. I have tried both opening and importing with the same result of nothing showing up on the screen.